Experienced Refinishing Contractors at Al Havner & Sons Hardwood Flooring provide Hardwood Floor Refinishing Services across Ypsilanti, Ypsilanti Charter Twp, Ann Arbor, Canton, Novi, Livonia, Warren, Sterling Heights, Troy, Auburn Hills, Ferndale, Berkley, Royal Oak, Farmington, Farmington Hills, Southfield, Madison Heights, Birmingham, West Bloomfield Township, West Bloomfield, Bloomfield Hills, Wixom, South Lyon, Rochester, Rochester Hills, Grosse Pointe, Grosse Pointe Woods, Grosse Pointe Shores, Dearborn Heights, Dearborn, Detroit, Bloomfield Township, Northville, Beverly Hills, Grosse Pointe Park, Grosse Pointe Farms, Michigan. Most people who are looking to hire a Floor Refinisher Contractor call me and ask what my square foot price is for Refinishing. That's the last question you want ask first. Hiring a flooring contractor is not like hiring a lawn mowing company to cut your grass. There are a hundred different ways you can get short changed on your job and we practice none of them. Please take the time to read this article as it could save you many headaches. Proper floor refinishing requires a floor sanding expert with several years experience. Al Havner and Sons has that experience. I have never and will ever put a crew out in a truck without several years experience. When we do hire an experienced floor mechanic they undergo at least six months training to do it the Havner way. Proper floor sanding procedures, depending on the condition of your floor would start off with what we call the rough cut. Sometimes a very coarse 12 grit sanding paper may be used and finished with 120 grit. Again depending on the floor condition, we may have to make several passes across the floor using incremental grits that may require five complete sandings. This part of the refinishing process in my opinion is one of the most important of all; something that most contractors won't do. If they do, it's just a spot fill, or filling some of the larger gaps and leaving most of the others. Very few do what we call a full trowel fill. Not filling a floor at all will usually result in a floor not nearly as slick as one that has been filled. 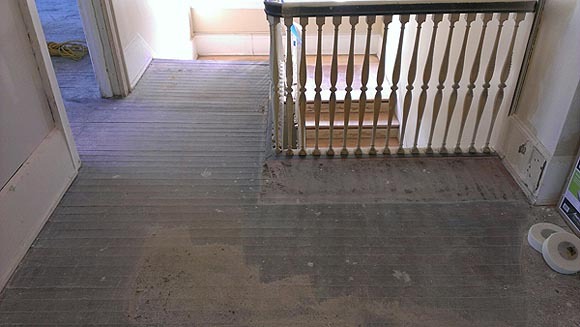 When we apply the finish to an unfilled floor, our applicators will drag dust and contaminates out of the cracks resulting in a rougher finish than normal. Just before we do the final sanding we pour a bucket of wood filler out on the floor and trowel fill your entire floor, filling all nail holes, chipped boards, and cracks between the boards. If there are any loose boards in the floor, some of this filler may pop back out during the final sanding. There is nothing we can do for this, but we usually get 95% of the cracks to stay filled. The final sanding of your floor is done with a buffer and sanding screen. This is by far the most important part of any floor refinishing job. Screening is what gives your floor the smooth as a baby's bottom feel. Brand new sharp screens are essential. We typically use as many as five new screens on a 1,000 square ft job with two sides to each screen that is used. Most contractors will us at most two screens. Something I have always told my employees is I don't care how much sand paper or screens you use, if you think it's dull throw it away. Two questions I would ask a contractor before I hired him would be what kind of stain do you use and how do you apply the stain? There are two ways to do it. The right way and the wrong way, We do it the right way. The wrong way is a method that has been sweeping across the country for a few years now where they apply stain using a buffer. This method is faster, easier, and only requires half the stain to complete. The right method is getting down on your hands and knees and wipe on and wipe off. Now you see why they use a buffer? It's easier! Buffed on stains don't even match the color chart they may have shown you to pick colors from. They appear washed out in comparison. The more stain you get to penetrate into the wood the better build you will get with your finishes. The second question I would ask is what kind of stain do you use? If they say anything other than Duraseal or Bona hang up the phone. Duraseal is the original hardwood floor finish, made by Minwax and formulated for floors, Bona is a knock off of Duraseal but equally as good. A lot of people use Minwax because they have the same colors and it's half the price, Minwax makes Duraseal for a reason. There have been many scientific studies on water based finishes vs. oil based finishes. I threw out all the scientific mumbo jumbo many years ago and did my own experiment. I coated half my floor at home with oil base and the other half with water base way back early 90's when water base was no where near as good as it is now. I did my own scientific experiment that involved our dog, four boys and one girl (all teenagers at the time) my wife and I, and a slew of neighborhood kids. To make a long story short, the water based won hands down. I can honestly say there is no contractor who has used water base longer than me in the entire metro Detroit area. My choice in water base finishes is a product made by Basic Coatings called Street Shoe. A three coat system is what we use and is suggested by Basic Coatings. If you want to double the wow factor, add a fourth coat. The finish comes in four sheen levels, gloss, semi gloss, satin, and super matte. 99% of floors in our area are finished with satin. My personal favorite is the super matte four coat system. It gives the appearance of a hand rubbed floor, and the WOW factor is amazing. Speak to our Refinishing Contractors in Dearborn Heights Now. 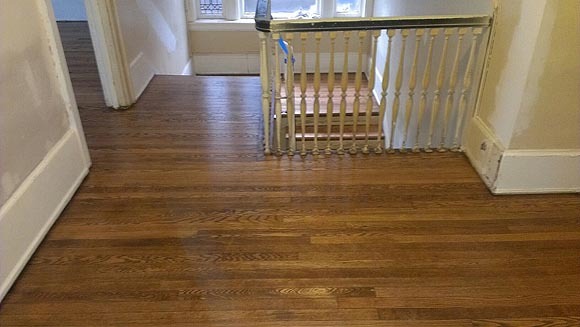 Before & After - Older floor in Royal Oak brought back to life. Dura Seal chestnut stain color and water based satin finish used.